How fresh the flag flutters. 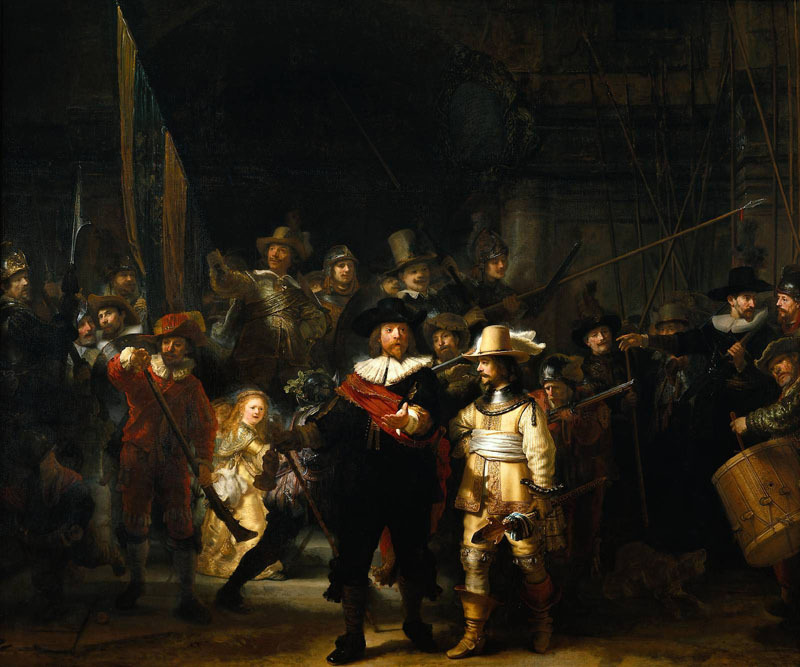 Pulsating with life — a drum is beaten, a dog barks, lances and muskets are raised, a flag is flown, children run about in all directions — The Night Watch is regarded as the masterpiece of the great Dutch painter Rembrandt van Rijn. The only oddity is that the subject of the painting is not a night watch. The title emerged towards the close of the eighteenth century after the many layers of varnish coating the surface of the painting had considerably darkened. The gloom thus produced led to the idea that the scene was captured at night. The original title of the painting was The Company of Captain Frans Banning Cocg. Instead of depicting a night watch, it is a group portrait of Amsterdam militia men. At the time it was painted, Amsterdam was Europe's leading mercantile city, with three civic militias. They called themselves The Crossbowmen, The Long-bowmen and The Guild of Arquebusiers after the weapons the men of their companies had borne in the Middle Ages. The militias recruited members from the pool of men in their city fit for military service, while each district had its own company. In times of war and unrest, the militias fulfilled the function of protecting the community. 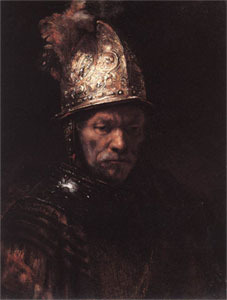 Before Rembrandtt's time, their duties included patrolling the ramparts of the city and mounting guard at its gates. In 1653 Rembrandt settled permanently in Amsterdam. The civic militias still retained something of their military character, although by then theirs was predominantly a social function. The traditional guilds with their historic past represented different sections of the city, sometimes marking political factions, and their members paraded at civic festivities. Commissioned in 1640 by the Amsterdam Arquebusiers to paint their group portrait, Rembrandt probably portrayed the members before they were to participate in a traditional parade, which may have been held in celebration of the visit of the French Queen, Marie de' Medici, in 1638. Contemporary sources show that the queen was welcomed by the marksmen's guilds and was accompanied by them in a ceremonial parade to a lavish feast in the festival hall of a guild house. Rembrandt's company of men was possibly depicted early in the morning of this royal visit. Led by their captain, Frans Banning Cocq, a reputable Antwerp merchant, the guild members seem to be about to take leave to greet the French queen outside the city. The large painting with its life-sized figures most likely hung in the festival hall of the Arquebusiers' guild house. In 1715 it was transferred to Antwerp's Town Hall. Because it was too large for the space it was to occupy there, it was promptly cut down to size.